Myxomas are most frequently encountered between the third and sixth decades of life, more commonly in women. Most cases are sporadic while approximately 10% are familial and show an autosomal dominant mode of transmission. Approximately 90% of these tumors are solitary and pedunculated. Right atrial myxomas may remain asymptomatic or eventually cause constitutional signs and symptoms due to the production of interleukin-6. Pulmonary embolism of tumor fragments or thrombus from the tumor surface may also occur. Less frequently, obstruction of the tricuspid valve occurs, resulting in exertional dyspnea, syncope or sudden death. Signs and symptoms, however, depend greatly on tumor size, position and mobility. Neurological manifestations in patients with atrial myxoma are reported in 25%-45% of cases and may be secondary to cerebral infarction, cerebral hemorrhage and, more rarely, subarachnoid hemorrhage. Neurological manifestation as initial presentation of atrial myxoma is found in approximately 36% of cases. Neurological manifestations are, however, almost the exclusive preserve of left atrial myxomas and are rarely, if ever, associated with right atrial myxomas. We present the case of a middle-aged Nigerian man who died 6 h after presenting with severe headache and sudden loss of consciousness. Autopsy revealed a large right atrial myxoma, a ventricular septal defect, and a small area of hemorrhage in the left temporal lobe of the brain. A 50-year-old man presented for the first time at the accident and emergency department of our hospital with an hour's history of headache and subsequent loss of consciousness. Examination revealed a middle-aged man who was unconscious with a Glasgow coma score of 7/15. His blood pressure was 190/130 mmHg and his pulse rate was 86 beats per min. The first and second heart sounds were normal and no murmurs were heard on auscultation. The patient was tachypneic and had a respiratory rate of 40 cycles/ min. Fine crepitations were heard in both lung fields. The intra-abdominal organs were not palpably enlarged. An assessment of cerebrovascular disease was made. He was subsequently admitted into the accident and emergency unit and appropriate treatment instituted. He, however, died about 6 h after presentation. At autopsy, the patient's heart weighed about 600 g. The left ventricular free wall thickness was 1.5 cm. The right ventricle was flabby and hypertrophic with a right ventricular free wall thickness of 1.1 cm. The tricuspid valve ring circumference measured 12.6 cm while the pulmonary valve ring measured 7.2 cm. An interventricular septal defect measuring 4.5Χ1.5 cm was seen in the posterior portion of the muscular septum. Within the right atrium, there was a globular, multinodular mass filling the entire right atrial cavity and attached to its posterolateral wall by a short stalk. The mass measured 9.2Χ7.5.0Χ4.0 cm [Figure 1]. The external surface of the mass was smooth and grayish-white in color while the cut surfaces revealed grayish-white tissue with a gelatinous consistency. A large thrombus measuring 2Χ2Χ2 cm was seen firmly adherent to the tip of the mass. The coronary and pulmonary arteries were all normal. The brain weighed 1400 g. There was a localized, well-circumscribed intraparenchymal hemorrhage within the superior left temporal lobe. The hemorrhagic area measured 1.2Χ 1.0Χ0.8 cm. There was no evidence of brain herniation or injury to the brain stem. The liver was mildly enlarged and showed fatty change while the kidneys showed macro- and micro-scopic evidence of benign nephrosclerosis. Microscopically, sections from the globular mass showed typical round to polygonal myxoma cells with abundant cytoplasm dispersed in a markedly loose amorphous myxoid extracellular matrix [Figure 2]. Focal areas of calcification and hemorrhage were seen within the mass. From its large size, it may be assumed that the tumor was of long standing duration. Many patients with atrial myxoma experience a significant delay in diagnosis that can be attributed to the absence of symptoms, to misleading cardiac symptoms, or to the presence of extracardiac symptoms that fail to suggest the proper etiology. A recent study showed that the mean duration from the onset of neurologic symptoms to correct diagnosis was 36 months, and only 5.7% of patients with atrial myxoma had the proper diagnosis suggested clinically. It is, therefore, not surprising that this tumor was only discovered at autopsy in this patient. When myxomas become more bulky, constitutional signs become more prominent, reflecting the tumor's obstructive presence. The most common symptom is dyspnea, which occurs in approximately 80% of patients with atrial myxoma. Nonspecific constitutional symptoms are reported in 10%-45% of patients. Not surprisingly, constitutional symptoms are reported most often in patients with left atrial myxoma, which occurs five times as often as its right atrial counterpart. Our patient serves as a reminder that such symptoms can also predominate with pathology on the right side of the heart. Right atrial myxomas may present with dyspnea, syncope, distension of neck veins, and other symptoms, which are related to tricuspid stenosis or frank interference with blood flow through the right heart. Our patient presented with both tachypnea and loss of consciousness. We suspect that these clinical symptoms and signs are the result of the obstruction to blood flow through the right heart by the tumor owing to its large size. This is further supported by the presence of hepatic steatosis in this patient. 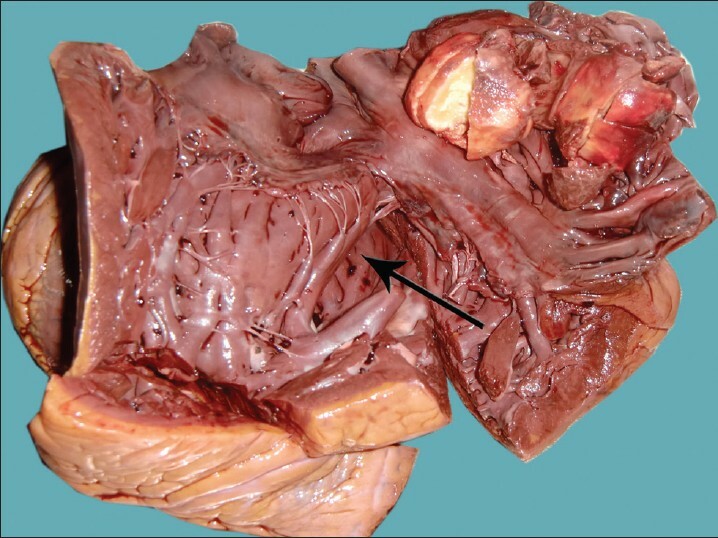 This obstruction may have significantly contributed to disease outcome in this patient as syncope and sudden death from complete obstruction of the tricuspid valve orifice are known to be the commonest causes of death in patients with right atrial myxomas. , A temporal lobe bleed of the size seen in this patient cannot solely account for the sudden loss of consciousness and death within 6 h of presentation especially in the absence of any detectable abnormality in the brain stem. Myxomas may also lead to multiple emboli in the cerebral circulation, depending on their location or other associated abnormalities, causing cerebral infarcts and hemorrhages. Formation of intracranial aneurysms, a less common phenomenon, may also be an associated event. Several possible mechanisms of aneurysm formation have been proposed. Indeed, some histopathologic studies have detected myxoma cells in the wall of aneurysms and others the interruption of the internal elastic lamina of cerebral arteries by invading tumor cells. Even though severe hypertension is a major cause of intracerebral hemorrhage in our environment, it is also possible that the hemorrhage in this patient could have resulted from an aneurysmal rupture following tumor migration from the right atrium through the ventricular septal defect into the systemic circulation - a form of paradoxical embolism. This association is extremely rare as extensive literature search did not yield any positive results. Interestingly, some authors have suggested that the hypertension found in patients with atrial myxoma may just be a stress response to the cerebral embolism as a result of the elaboration of pro-inflammatory cytokines and other mediators of paraneoplastic syndromes. Thus, the atrial myxoma in this patient may ultimately be linked to the intracerebral hemorrhage. The diagnosis of atrial myxomas can be established by echocardiography, gated radionuclide blood-pool scan, or cardiac catheterization. Occasionally, the diagnosis is made by histologic examination of an embolus removed at operation. Surgical excision is important for preventing obstruction of the tricuspid orifice, eliminating tumor emboli, maintaining systolic function, and restoring biventricular diastolic function. This gives excellent short- and long-term results especially with non-familial myxomas. Right atrial myxomas are rare and intracranial hemorrhage (in the context of a ventricular septal defect), syncope, and dyspnea are possible, though uncommon, initial clinical presentations. They should be considered in the differential diagnosis of cerebrovascular accidents. 1. Novendstern SL, Silliman SL, Booth RP. Cerebrovascular complications of atrial myxoma. Hosp Physician 2001;8:39-42. 2. McCoskey EH, Metha JB, Krishnan K, Roy TM. Right atrial myxoma with extracardia manifestations. Chest 2000;118:547-9. 3. Markel ML, Waller BF, Armstrong WF. Cardiac myxoma: A review. Medicine (Baltimore) 1987;66:114-25. 4. Browne WT, Wijdicks EF, Parisi JE, Viggiano RW. 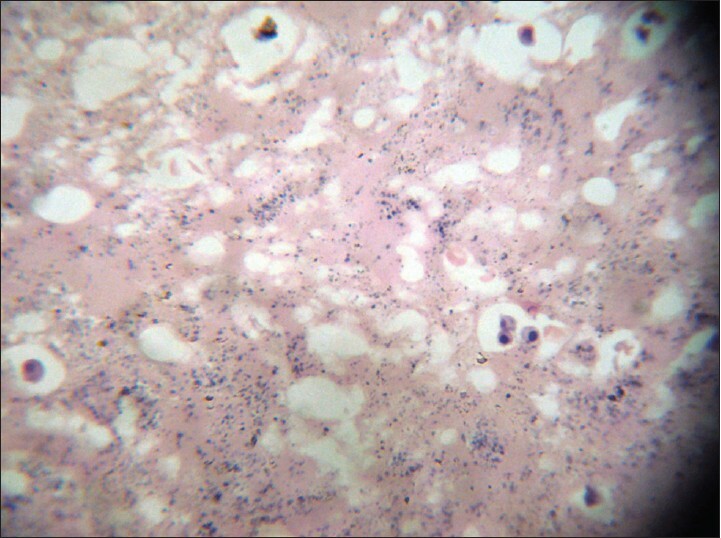 Fulminant brain necrosis from atrial myxoma showers. Stroke 1993;24:1090-2. 5. Azevedo O, Almeida J, Nolasco T, Medeiros R, Casanova J, Bartosch C, et al. Massive right atrial myxoma presenting as syncope and exertional dyspnoea: Case report. Cardiovasc Ultrasound 2010;8:23-5. 6. Azevedo de Almeida L, Heub JC, Silva MA, Bazan R, Estrozi B, Raffin CN. Cerebral ischaemia as initial neurologic manifestation of atrial myxoma: Case report. ArqNeuropsiquiatr 2006;64:660-3. 7. Knepper LE, Biller J, Adams HP, Bruno A. Neurologic manifestations of atrial myxoma: A 12-year experience and review. Stroke 1998;19:1435-40. 8. Herbst M, Wattjes MP, Urbach H, Inhetvin-Hutter C, Becker D, Klockgether T, et al. Cerebral embolism from left atrial myxoma leading to cerebral and retinal aneurysms: A case report. AJNR Am J Neuroradiol 2005;26:666-9. 9. Modi K, Venkatesh P, Agnani S, Rowland T, Reddy P. Sudden death in a patient with left atrial myxoma: Report of two cases and review of literature. BJMP 2010;3:311-8. 10. Ojji DB, AjidukuSS, Omonua OO, Abdulkareem LL, Parsonage W. A probable right atrial myxoma prolapsing through the tricuspid valve into the right ventricle: A case report. J Med Case Reports 2009;3:9328. 11. Baikoussis NG, Siminelakis, Kotsanti A, Achenbach K, Argyropoulou M, Goudevenos J. Multiple cerebral mycotic aneurysms due to left atrial myxoma: Are there any pitfalls for the cardiac surgeon? Hellenic J Cardiol 2011;52:466-8. 12. Anvari MS, Boroumand MA, Karimi A, Abbasi K, Ahmadi H, MArzban M, et al. Histopathologic and clinical characterization of atrial myxoma: A review of 19 cases. Lab Med 2009;40:596-9. 13. Shimizu M, Okuri H, Yokoyama H, Kawada H, Takizawa T, Kikawada R. A case of right atrial myxoma- effect of a large myxoma in the right atrium studied by M-mode and Doppler echocardiography. JpnCirc J 1995;59:579-86. 14. Bhan A, Mehrotra P, Choudhary SK, Sharma R, Prabhakar D, Airan B, et al. Surgical experience with intracardiacmyxomas: Long-term follow-up. Ann ThoracSurg 1998;66:810-3.